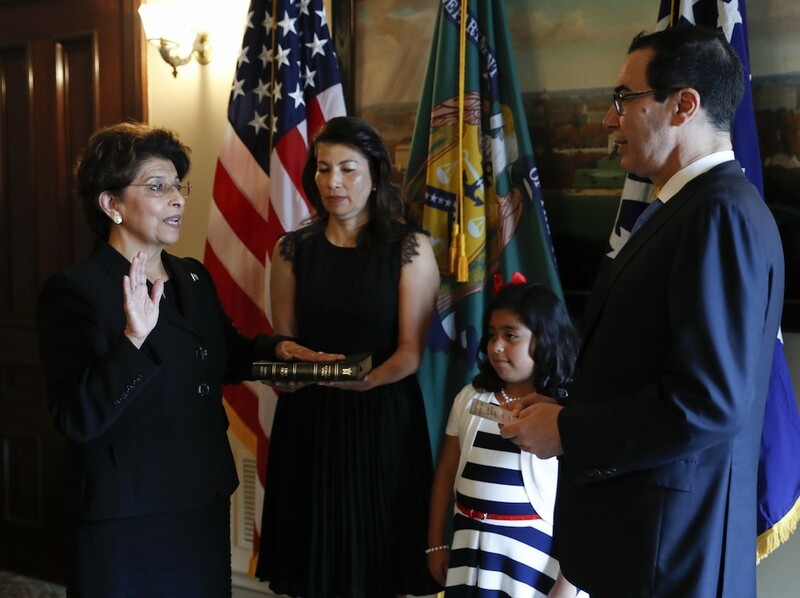 Through the din of Washington, it was lightly reported that Jovita Carranza was sworn in as the 44th Treasurer of the United States on June 19, 2017, by Secretary of the Treasury Steven Mnuchin. Joining Carranza at the ceremony was her daughter Klaudene Carranza and goddaughter Lily Hobbs. Since the appointment of Georgia Neese Clark by President Harry S. Truman in 1949, there have been 16 women appointed as Treasurer of the United States. Carranza is the seventh Latina to hold the job and the fourth straight since the appointment of Rosario Marin in 2001 by President George W. Bush. Carranza will oversee the Bureau of Engraving and Printing and U.S. Mint. Since there have been problems reported with Cabinet secretaries getting senior officials to be accepted by the head of the presidential personnel office, the current structure at the U.S. Mint will stay in place. Carranza will take an active role overseeing the mint until a director is appointed.